I received a friendly email the other day asking what NES clone I would recommend. While I have talked about all of the major players in the past, I haven’t actually owned any myself, nor had I done enough research to give a reliable answer. Also, I thought it would be nice if I produced a detailed article to present to him and share with future shoppers instead of a quick response. Below, you will find the results of my research of both NES clones and Nintendo’s two official console releases. I’ve tried to summarize all my findings in an easy to digest manner and everything is pulled from a variety of reviews and conversations about each machine. If you would like to add your own experiences, feel free to use the comments section below. If you want a modern machine from a US-based company that has a style worth showing off, the Generation NEX may be for you. You will have to pay a bit more money for those benefits, but you may think it’s worth it. You must be willing to make some sacrifices in terms of glitches and compatibility, since this is a clone. If you want the absolute cheapest way to play real NES games on your TV with the least amount of hunting around, picking a Yobo machine is a solid selection for you. Sure, in a few ways you get what you pay for, but if your expectations aren’t too high, this might do the trick for you. If you want to save space and cable mess by having and NES and SNES in one machine, this may be for you. 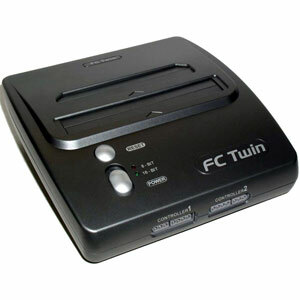 This machine is also good for cheapskates as it is much cheaper than the Generation NEX or buying both an NES and SNES. Not recommended for HDTV owners as a real SNES at least has S-Video support. You’ll also need to accept some graphical and sound compromises for NES gameplay in addition to giving up games that require NES accessories like the Zapper and Power Pad. Finding a good deal on one can be difficult as well. The machine is about 20 years old and won’t live forever. If you want the absolute best NES compatibility, nostolgic style, but are willing to put up with hunting down a machine in good condition, the original system is for you. Just beware of it’s mechanical imperfections. If you want perfect game compatibility, but would like a slimmer package and lower failure rate, the Model 2 NES might fit you well. This is definately not the machine for you if you want to hook it up to a larger HDTV however due to the RF-only output. I do have one problem with Yobo, for some reason that thing smells terrible, it smells like cheap melted plastic, not sure it happens to anyone else but w/e. Its just the smell just gives me a headache. I think I will get the NEX or the regular NES. I’ve used Yobo products before but just their accessories. I just bought a Sega Saturn thought so I will have to wait a bit to buy the console. Thanks for the article. The AC adapter for the FC Twin is a piece of crap. My roommate has that thing. Just a day or two ago I read that there was actually a version of the NES Model 2 that DID retain A/V output, with the caveat being that it’s hard to make sure you’re getting one from Ebay. 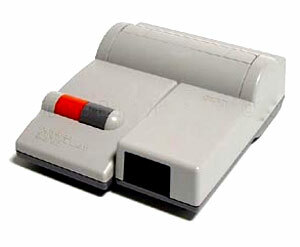 I can’t understand why anyone would by a Famiclone. No way any of those clones can compete with the real thing. A model 1 NES isn’t that hard to come by. You won’t score one as cheap as a Genesis or even a Saturn, but the games themselves are cheap and easy to find. If you have one with a replaced 72 pin connector, it’s perfect. Plus, like Racketboy says, the thing just looks iconic. There’s no mistaking that sweet piece of hardware sitting by the TV. People come over and freak out and want to play it, even if they’re not “gamers.” Even the official model 2 NES doesn’t have that going for it. RadarScope1: I want a NEX, but for only one reason: Famicom. $70 is a lot cheaper than any Famicom system I’ve seen on eBay, and I’ve never seen one anywhere else. There are also a number of Asian “knock-off” models that look very much like the original, but are cheap junk; they’re hard to distinguish in pictures on eBay. I’ll always keep an NES (I have several) next to the TV, but until I can afford to add an official (genuine) Famicom to my collection, I’d like to have a NEX for import action. BTW, I thought the NES 2 was AV-only. I guess I was wrong. 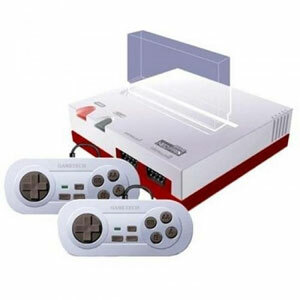 However, wasn’t the similar Japanese model called “Famicom AV” for that reason? Or am I thinking of something else? Yeah the jp model 2 is the “AV Famicom” and it has the composite connections. They stripped it out for the US version for dumb reason. Yet another reason I have no interest in getting a top-loading NES. Overrated and overpriced! One NES clone that I was curious about that didn’t make the list is the Blaze Retrocon (http://www.superufo.com/pp/p_news_content.asp?news_id=50). Just wondering if anyone has any experience with this particular one. Thanks. There is an article about the retrocon at this link http://www.nintendobaby.com/?p=157 the reviewer says it isn’t compatible with the controllers. Can someone confirm that. about 6 months ago i bought a chinese VCD player brand ‘OMIYA 3060’ (VERY cheap… 30 bucks). Actually, it didnt play vcds very well, but apart from that it had radio, a microphone for karaoke, a lens cleaner disc, and guess what? two nes-style gamepads and a gun. 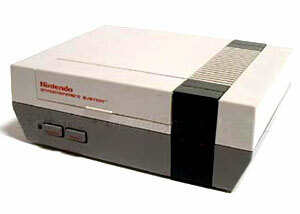 it also had a disc called Game Nes 300, which had… guess what??? yes, you are right. 300 classic nes games. when u insert the disc in the player appears a menu where u can scroll from different folders and select bad named games like 1943.nes pacman.nes and castle1.nes …… ;). i opened the disc in my pc and expected to find some unknown format, but guess what? it had standard windows folders, and standard roms. the problem is that when i try to open the games in some emulator it says ‘wrong format’ or things like that, but the rom sizes are similar to my good nes roms. but my biggest problem is that i want to rename all those roms using some tool like GoodNES goodsets and it also doesnt want to recognize them. i tried lots of tools, but dont have any success in renaming those roms… what could be wrong, their header, their checksum, or what? I had a NEX and had to return it. The video and audio were just too off. And the games that were listed as not working on the Yobo also don’t work on the NEX. The Messiah people used to (maybe still do) claim the NEX was not a NES-on-a-chip solution like other clones, but after many dissections by 3rd parties it’s clear it’s not really any better than the other NOAC clones save that it uses NES peripherals. Buy a real NES and repair the cartridge slot. Don’t waste your $70 on a NEX. Thanks for the input. I know it sounds lazy but I don’t really want to spend a lot of time repairing the cartridge slot. I might do that during christmas break though. I already have 15 games( not including duplicates so I would like to be able to play them. A potential warning to those who would buy Famiclones: When I was at a convention recently a vendor warned me that the connection pins of most Famiclones are too tight and can eventually scrap the copper of a cartridge. 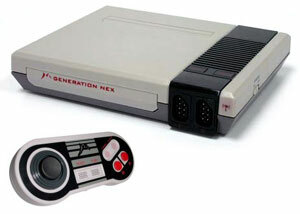 I don’t know if this necessarily true, however I do know the connection on my Generation NEX is much tighter then my old model NES. Whoo! Thanks for the links, old chum. 🙂 And great article too, as always. I won an auction on ebay $27 including shipping. Here is a link to a cheap top loading one http://cgi.ebay.com/ws/eBayISAPI.dll?ViewItem&rd=1&item=300140640625&ssPageName=STRK:MEBI:IT&ih=020. As for the clones fitting too tight, it could be that the plastic on the sides of the connector is making too tight a fit and either the plastic (most likely) in the connector or the sides of the board in the cartridge are wearing down. As long as the sides of the connector don’t crack, it should be ok.